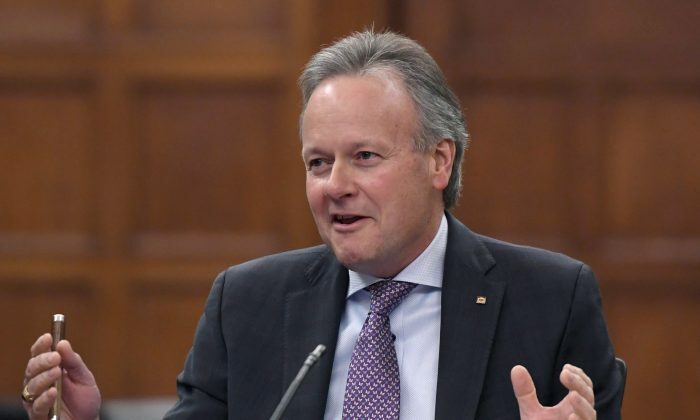 OTTAWA—Canadians have amassed a $2 trillion mountain of household debt that’s casting a big shadow over the timing of the Bank of Canada’s next interest rate hike, governor Stephen Poloz said in a May 1 speech in Yellowknife. To Poloz, the “sheer size” of debt burden also means its associated risks are to endure for a while, although he’s optimistic the economy can navigate them. The debt pile, he said, has been growing for three decades in both absolute terms and when compared to the size of the economy—and about $1.5 trillion of it currently consists of mortgage debt. But the central bank stuck with its benchmark rate of 1.25 percent last month as it continued its careful process of determining the best juncture for its next hike. The bank’s next announcement is May 30, but many experts only expect Poloz’s next increase to come at July’s meeting. Poloz said that the volume of what Canadians owe is one of the key reasons why the bank has been taking a cautious approach to raising its trend-setting rate. He called it an important vulnerability for individuals and leaves the entire economy exposed to shocks. If it raises rates too quickly, the bank risks choking off economic growth, falling short of its ideal inflation target of 2 percent and could lead to the type of financial stability risk it’s trying to avoid, he said. In his speech, he also noted several other areas of concern the bank is monitoring closely as it considers future hikes. They include the economic impacts of stricter mortgage rules, the ongoing uncertainty about U.S. trade policy, the renegotiation of the North American Free Trade Agreement, and a number of competitiveness challenges faced by Canadian exporters.